A Simply Chocolate exclusive! Fine chocolate lovers will be thrilled & delighted when they open this opulent textured gold gift box of premium chocolates from famed chocolatier Knipschildt. 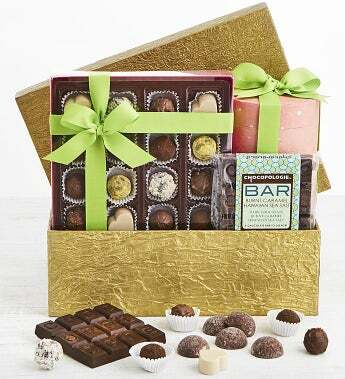 They'll adore the amazing 16pc Chocopologie Assorted Truffles box with intriguing flavors that include strawberry basil and peanut butter & jelly. They'll be even more impressed with the decadent The Chocopologie Fair Trade Certified Dark Chocolate Raspberry Ganache Truffles and the Chocopologie Burnt Caramel Hawaiian Sea Salt Chocolate Bar. This beautiful gift is carefully packed and tied with a lovely spring green ribbon. These premium chocolates are packed with cushioning paper inside the textured gold keepsake box and the box is tied with a lovely spring green ribbon for a beautiful gift box presentation.